FREE Pebble Dashing Specialist Quotes! Water & Impact Resistance & Low Maintenance Decorative Finish! Pebble-dashing is the application of small stones stuck to an exterior rendering on properties, it's also known as Dry-dashing, Harling and rough-casting. Pebbledash is the modern version of an ancient rendering process from Roman times when they used a mixture of quicklime and sand applied to external walls to give a stippled effect. In certain places, pebble-dash is the perfect covering, particularly buildings which are exposed to harsh conditions in weather-beaten places. A Pebble Dash finish offers improved water shedding properties, good impact resistance, protects the substrate and also provides a low maintenance decorative finish in a wide choice of colours and textures. In fact, the primary use of modern render and pebble dashing is to protect the structure that on its own would not be able to withstand the weather. In common with all render finishes pebble dashing will not add any additional strength to a wall. Over the years many new aggregate products have been developed especially to give home owners and builders greater choice of finishes to create almost any colour scheme. Pebble-dashing also helps to keep heat in the home and allow properties to meet the requirements of legislation in terms of thermal efficiency. 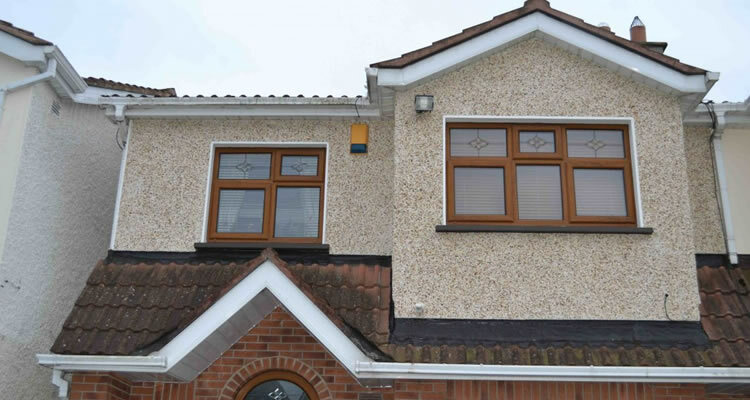 The use of pebble dashing as an external wall insulation extends the life of properties too, giving a maintenance free finish that will often last the lifetime of the property. Although extremely popular in the UK, pebble-dashing is also becoming more popular on the continent thanks of a lack of suitable clay bricks. Though there are significant differences between UK pebble-dashing and the continent, due to the pervading dampness and high humidity in Britain. Plastering & Pebble dashing companies provide a comprehensive range of plastering services to both domestic and commercial clients. Always choose a plasterer with many years of experience in plastering and the building trade that offers free, no obligation quotes. Price is important but choosing a professional that offers quality plastering work and friendly and professional workmen. Rather than choosing the lowest price, consider their reputation for quality workmanship, organisation and cleanliness, then check they offer competitive rates rather than just the cheapest price. Reputable plastering & pebble-dashing companies will also offer a guarantee on their work, often insurance backed for complete peace of mind. Consider all the benefits of using a professional company that guarantee a great and long lasting job, rather than hiring a bargain basement local builder. The best way to get in contact with tradesman near you is to use the free "post your job" button on this page to have local companies get in touch with you to offer advice and written quotes for pebble-dashing your property. If you want a typical semi detached house rendered with pebbledash. This will require scaffolding and it will take a 3 man team around a week to complete. Typical cost would be around £4000 to £5000, including labour, scaffolding and materials. This works out at roughly £1450 per wall, so for a detached property expect a bill of roughly £6000.